Little remains of the old Mule Barn (14160 Valles Mines School Road) but its stone foundation. 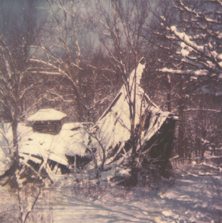 This picture was taken in 1978 in the heart of Winter. The nearby Tractor Shed (not shown) is all that remains of how things got hauled around in the days of yore. The Missouri Mule, once legendary, has fallen from favor along with the Cavalry and the horse-drawn cannon. However, for the better, in 1995 the Missouri mule was designated as the official state animal. Some have chosen to keep the tradition of this sturdy animal alive and tack and gear for them is still available. Many are fond of this unusual animal and even show their Zebra Hybrids and 'Zorses'. For more info, see the State of Missouri's helpful webpage. The last mule to work on the property belonged to the late Tom Jarvis, our logger in 1986, who used a pink-nosed mule to skid logs out of tight places in the forest and to help position the sawlogs for easy loading onto the log trucks on the landings. Fortunately, just as we were getting lonely for more mules, we were visited not too long ago by Mr. Larry French who was kind enough to bring his mule wagon and mules to visit. If you have a mule or pictures you want to share, please let us know.